The RMCHCS Behavioral Health Collaborative was formed to broaden support for alcohol and substance abuse prevention efforts by organizing, educating and empowering local providers, community service representatives, and city, county and state agencies on a variety of topics. Not least of these issues are education, housing and transportation. Through numerous culturally appropriate workshops and seminars, the Behavioral Health Collaborative has helped its stakeholders generate renewed activity on behalf of our community. Many of the workshops have targeted an audience of providers, but others were designed to speak directly to the local population-providing a link to support for those suffering from physical and mental abuse; those in need of improved parenting skills or family support; and those contending with grief or suicidal thoughts. 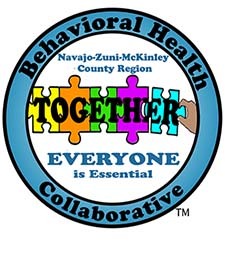 The Behavioral Health Collaborative works with the Gallup Indian Medical Center and Navajo and Zuni Tribal authorities to gather and share information regarding the state of Native American healthcare. Attached below is our 2017 Annual Report and a Community Resource Directory compiled by the Collaborative. Please contact RMCHCS at 505-726-6851 to submit any corrections, updates or additional information.